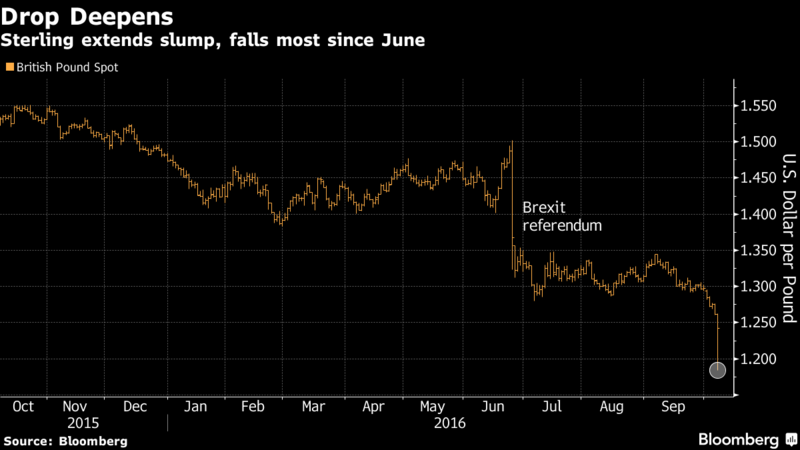 The pound plunged as much as 6.1 percent against the dollar, the biggest decline since the day the U.K.’s Brexit referendum result was announced, in a move that traders struggled to immediately explain. Sterling sank as low as $1.1841, according to data compiled by Bloomberg, the lowest since March 1985. The pound quickly pared the drop, trading 1.1 percent weaker at $1.2472 at 9:26 a.m. in Tokyo. Traders questioned whether computer-driven orders had triggered the plunge, exacerbated by a lack of liquidity in early Asian hours, while some saw the possibility of human error, or a so-called “fat finger.” Others pointed to a Financial Times article citing French President Francois Hollande as saying the U.K. must suffer the consequences of leaving the European Union. 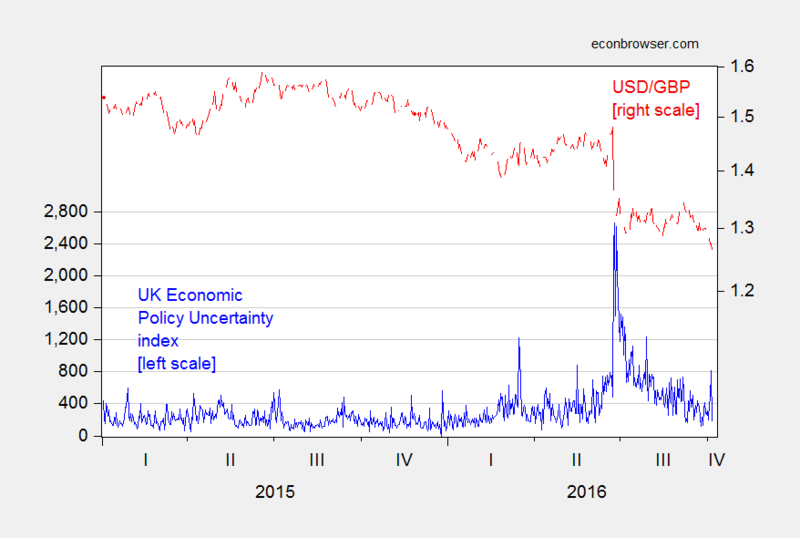 Figure 1: UK Daily Policy Uncertainty Index, accessed 10/6/2016 (blue, left scale), USD/GBP exchange rate (red, right log scale). Source: policyuncertainty.com, Fed via FRED. While some have pointed to the resilience of the UK economy thus far, I think it’s too early to conclude economic growth will be sustained. NIESR has released estimates for September; the trend in the industrial output series is worrying. Figure 2: Real GDP (blue), and real industrial output (red), both 2013=100, on log scale. Source: NIESR 7 October 2016. This entry was posted on October 6, 2016 by Menzie Chinn. While this will make imports more expensive for Britain, it does make goods manufactured in Britain suddenly more competitive for export. Bad news; good news. Is manufacturing a big enough component to make a difference? 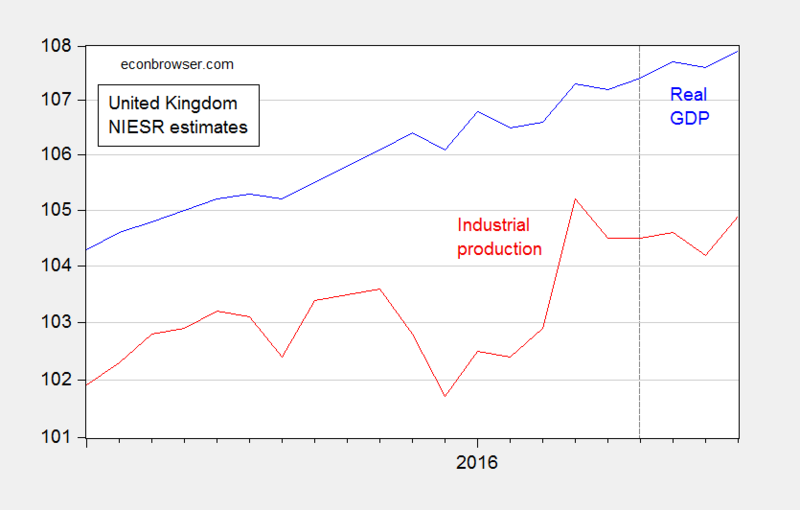 According to the World Bank data base manufacturing as a percent of UK GDP has been flat (around 10.3%) since 2009. That’s roughly half of what it was 20 years ago. One of the UK’s “exports” comes in the form of university educations for foreign students. This is a big market for the UK. In fact, according to the most recent data (2014), the UK actually has more foreign university students than the US (273K vs 270K). The UK has the largest market share in the world. But that’s an “export” that will dry up. The bottom line is that the UK is basically a service oriented economy (78% according to the World Bank). It’s also heavily dependent upon the financial services sector (8%-10% of GDP). It’s vey hard to see how an economy that is that dependent upon education and financial services can offset the losses from Brexit through depreciation in the manufacturing sector. It’s really hard to see how London keeps its position as a finance capital. Of course, The Donald thinks Brexit was a great idea. That’s not to say things can’t get worse or that they would not have gotten worse if Britain did not vote to exit the E.U. However, the global economy is looking shaky given the enormous debt levels about which the IMF just warned. And Britain isn’t alone in questioning the value of globalization. http://www.economist.com/news/special-report/21707833-consensus-favour-open-economies-cracking-says-john-osullivan? So, maybe instead of being driven by ideology, we should be observers or reality and see what actually happens. This is quite an experiment going on in Britain, Europe, and the world in general. And it’s hard to separate one variable from all of the others in economic swings. Short term and long term effects may be different. Short term and long term effects may be different. I agree. The short run effects of Brexit are ambiguous. There are reasons why the UK economy might get a temporary bounce. There are reasons why Brexit might depress output in the short run. There are lots of confounding factors, including a relaxation of Osbourne’s austerity policies. In the short run it’s impossible to tell which of these effects will win out. But there is no ambiguity about the medium to long run effects of Brexit; it’s an economic loser. Period. End. Stop. But there is no ambiguity about the medium to long run effects of Brexit; it’s an economic loser. Period. End. Stop. But others are more willing to observe how decisions actually play out. Even with mistakes, economies have a way of correcting themselves unless they are being too grossly manipulated (like the U.S.?. Why blame only economists? Experts who study the universe know very little, or think they know. There has been some practical knowledge in economics, but too often politicians mess it up. Britain’s economy appears to be losing steam, with major business surveys showing a marked slowdown in the services sector and boardrooms beset by doubt about the future following the country’s vote to leave the European Union. While the economy has fared better than most economists expected since June’s Brexit vote – largely thanks to upbeat consumers – Monday’s surveys will heighten concerns about its longer-term prospects. Key measures of business investment and turnover confidence hit four-year lows in the third quarter, the British Chambers of Commerce (BCC) said in its Quarterly Economic Survey of 7,000 businesses – the largest of its kind. I think this is exactly where we expect uncertainty to have maximal impact, on decisions with implications of long duration. Bruce Hall I am not a “practitioner of the dismal science”, if by “dismal science” you mean economics. I trade in that other “dismal science” known as war. And yes, we do a lot of modeling and predictions. You seem to rely upon the Telegraph quite a bit….that’s not good. Allister Heath is a bit young to suffer from a failing memory, but there were some economists who were warning about a financial bubble. It’s just that almost all of those economists leaned left, which is why Mr. Heath might have missed their call. He also misremembers Britain’s economic performance in the 1980s. Britain’s economy played out almost exactly as economists predicted it would. I’m afraid Mr. Heath has fallen for the Maggie Myth. As to the question of monetary union with the euro, there no doubt were plenty of economists who were for it. I believe most of them were City economists of the type that the Telegraph would normally support. But I do recall some guy named Paul Krugman who warned against it. And there was this other guy…Simon Wren-Lewis who also warned against it. And guess what? They were right. They are also warning about the long run effects of Brexit. So if you want to follow track records, then you might want to follow Krugman and Wren-Lewis on this one. And oh by the way, both of them (Krugman especially) have cautioned opponents of Brexit to not overstate the short run effects of the Brexit vote (note…that’s “Brexit vote” not “Brexit implementation”, which hasn’t happened yet) because some of those short run effects could be positive. As to Mr. Heath’s prediction, well he seems to have missed the mark. One of his central predictions was that Brexit would be implemented in a sensible way that would allow Britain to capture much of the benefits of a single market without having to suffer the bad stuff. How’s that working out since the new PM announced her intention to go for a hard landing? Economies have a way of returning to some equilibrium path. But an equilibrium path is not the same thing as a higher or optimal path. No doubt Britain’s economy will tend towards a long run equilibrium; but it will be an equilibrium at a permanently lower output level relative to what it would have been had “Remain” won the vote. And if Scotland decides on independence due to the Brexit vote, then things will only get worse for rump Britain. Finally, just like in those blue-on-red war games, you don’t get the option of waiting to observe how things actually play out. You have to have a plan on the shelf, which means taking a position and basing your analysis on a combination of math, theory and data. Same with economic forecasting. You seem to be attracted to the idea of Brexit for ideological reasons and then want to wave away predictions of economic harm with some feigned equivalence in economic knowledge between Mr. Heath and professional academic economists. That’s really just a disguised version of the kind of anti-intellectual sneering that we see way too much of these days. Views of the shape of the earth might differ, but the earth is still a sphere. You seem to be attracted to the idea of Brexit for ideological reasons and then want to wave away predictions of economic harm with some feigned equivalence in economic knowledge between Mr. Heath and professional academic economists. That’s really just a disguised version of the kind of anti-intellectual sneering that we see way too much of these days. Views of the shape of the earth might differ, but the earth is still a sphere. I have no skin in the Brexit game or your war games. I only pointed out two things: the present situation in Britain is better than economists predicted and economists have made major mistakes in their past predictions. If that’s “sneering”, so be it. Predictions are usually a safe “war” game; people tend to forget them when they are wrong and boast about them when they are correct. “better than economists predicted”. but keep in mind, the action of brexit has not even occurred yet. some of the predictions, in the short term, are predicated on actions that will occur once a brexit officially begins. The political fall out and the long term social and economic damage of May and the Tory Party going full UKIP, that is another story. Finance and financial services businesses are by their nature “cosmopolitan,” with people coming from all over the world to work in London for 300 years. May and her Government seem set on killing the goose that lays that particular Golden Egg (a housing market in London and the Home counties that was driven to a large extent by foreigners and financial services industry is already going into a bust). The vision of the Tory Briexiters (as opposed to the UKIP Briexiters) to is apparently to create a British vision of “Galt Gulch” off the coast of Europe, to become the Atlantic Hong Kong and Singapore. How this is to be accomplished is best described as a variation of the “Underpants Gnomes” business plan. Further, it should be noted that both Hong Kong with China and Singapore with both ASEAN and China have fairly open economic and travel relations with neighboring countries (China itself restricts immigration from China to Hong Kong) and this appears increasingly unlikely as Briexit from the EU appears more and more likely to be an ugly divorce. Also, Hong Kong has a special and unique tax and land ownership system which I doubt the U.K. can imitate. Conditions in the UK are better than some economist forecast. Because the cost of Brexit will take some time before they occur — it probably will dampen long term growth — while the impact of the weak pound should occur fairly rapidly I have thought all along that in the short run the UK economy should do better than expected. I think I posted that at this blog shortly after the Brexit vote. The people who have gained nothing from the rise of globalization, London, and British financial services believe they have much less to lose from Brexit. They are probably correct although time will tell. The half of the UK who voted were not making an irrational bet, from their perspective, but simply a risky one. Just as the residents of London cried few tears for the stagnation of the rest of the UK over the last 30 years, they will cry few tears for the pain of those who rely on London and its financial services sector for their livelihood. In any case, sweeping statements about “the people” or “Britain” winning or losing together entirely miss the point. There are many different “people” in the UK, the impact of Brexit will differ for different groups, with those who voted for Brexit likely to lose the least. Don’t kid yourself that people voted for the good of all of the UK in this plebiscite, or in any of the elections that led to where the UK is today. They vote for themselves and those closest to them. Voters for Thatcher understood that they were voting to kill the coal industry and parts of the North. Voters for Brexit understand they are deeply wounding financial services and London. What goes around comes around.